Will the day come when we really don’t need secretaries any more? I’m convinced it will and I think I see the way it will come about. The first step is the normal executive desire to have the latest in gadgets. This will bring the computer to the elbow of the executive (as soon as some furniture firm wakes up to the need for an executive desk placing the computer where it is handy to use). The computer will begin by providing instant interoffice communications, access to data for decision-making, E-Z Calc worksheet planning and so forth. The word processor will encourage sending notes in answer to business letters, getting us into a much less formal correspondence style. Once we can live with a business letter which does not have to reassure the recipient of his name and address, much of the secretarial role will have faded away. Our computers will be able to remember addresses, file correspondence copies, and all of those lovely things the secretary used to do. Considering the problem of finding good secretaries, the path of least resistance for executives will be to depend more and more on that computer by their side. Speaking of which, it’s been some time since I’ve written about the need for smaller computers or terminals which are connected to the office computer system via a radio link instead of the usual umbilical cord. We have radio telephones now, so separating the computer from the system by a radio link is not a big step. We’re remote-controlling our television sets and lights, so why not our computers? My concept of the coming office computer is one that will be much like a hard bound book, with an LCD display inside the cover which can be read when you lift the lid. The keyboard will be like those on the hand-held computer systems, though in typewriter keyboard format. With a portable terminal like this you would be able to use it as a computer by itself, or, if you were around a host system, you could dump letters for printing, access data, and communicate with others via it and the phone lines. Recent calculator-sized television sets have an LCD screen which seems easily adaptable to our needs. Other than making things a bit smaller, there isn’t a lot more to invent before we have this new type of micro-micro computer. Little of this was a major insight in 1981. Green was very right and missed a few things, too. In my limited experience, the secretary was replaced with the executive assistant, and this is not merely a glorified title for secretary. It’s the spreadsheet that did it. In our office, it was the executive assistant who managed the spreadsheet, created presentations, and managed the budget. And the position literally grew out of the secretarial position in the department. By the time I left earlier this year, the traditional secretary of 1981 simply didn’t exist. More importantly, the secretary’s unofficial role in the past—understanding office politics—has become the executive assistant’s official role, in the sense that they are the ones tasked with creating and scheduling meetings between multiple areas and often even represent the department in cross-department meetings. It’s arguable that Green was absolutely right, and that what he was calling the secretary has disappeared. But other prognostications were right on the mark without equivocation. He didn’t name email, but he did recognize that it would result in “a much less formal correspondence style”. He was an Amateur Radio operator, so he knew we’d be connecting computers via radio link soon enough. He probably already saw it happening with RTTY—Radio Teletype—another Ham-related hobby. His prediction of the laptop is less impressive; the GRiD Compass was already being designed, and would be introduced less than a year later.1 LCD devices already existed. So while his publisher’s editorial is not impressive when you compare it against professional prognosticators—Ted Nelson and John von Neumann had done far better—this was just a businessman writing in his magazine, looking at early versions of CompuServe and seeing the future. There’s another article in the same issue, Digital Delivery by Bert Latamore, which talks about digital mail. Futurists disagree whether electronic mail will be major in the home for the rest of the century; they agree on the definition of electronic mail. Ray Boggs of the Consumer Division of Venture Development Corp., Wellesley, MA recently finished a study of the electronic home of the future. He concluded electronic mail “doesn’t fit in” as a communications device and will not replace the telephone. It didn’t replace the telephone, it took it over. I use my phone mainly now for what they would have considered electronic mail: texting; and emails in general. I have no landline, just an iPhone that is used far more as a mobile computing device than as a telephone. On the other hand, he and many others expect electronic money transfer arrangements in our future, allowing the consumer to send orders from home directly to the bank’s computer. “It will be precisely this kind of application that will drive the home computer market,” Boggs said. Francis O’Reilly, an independent business analyst for Business Communications Corp., Stamford, CT agrees with this scenario. He points out that financial transfers account for 90 percent of all first-class mail. The result would be less paperwork for the customer and less data entry for the bank. Your bills would come directly to your terminal through the network. Your employer could complete the cycle by having his computer deposit your pay directly into your bank. This was in fact mostly true, although their vision of it was very strange. Banks still haven’t truly embraced home computing and online management of accounts. Very few banks have a truly first-class account management system, and very few people bought their computers just because they wanted to manage their accounts online. That’s an afterthought when they’re done chatting in Facebook. Banks are not and never were the killer app in home computing. In response to 80-Micro and the TRS-80, 1983-1984: I’m going through some old 80-Micro magazines, and two editorials a year apart caught my eye. The GRiD used an ELD screen rather than an LCD screen, but outwardly resembled the flat screen laptops we still have today. 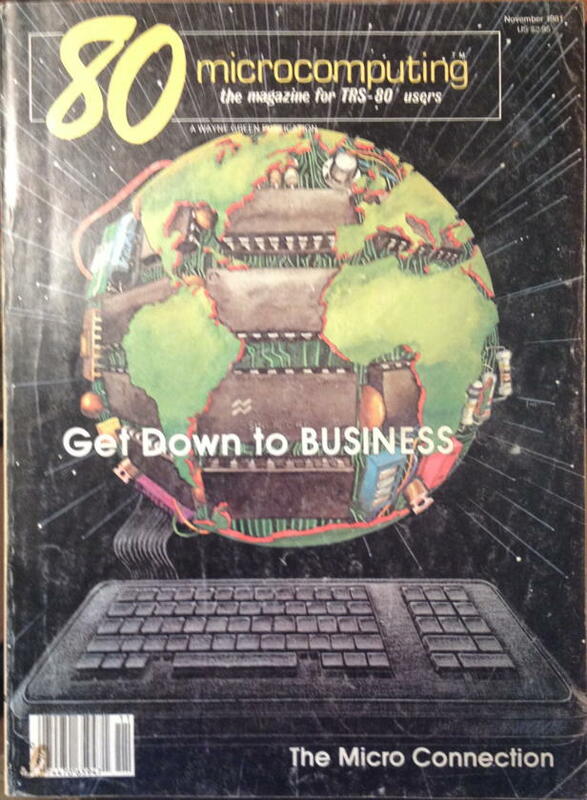 The covers of 80 Microcomputing from January 1980 through June 1988, plus a search of the table of contents. Go ahead, search me. Tandy Assembly was earlier this November, and I have never seen so many Radio Shack computers in one spot. Also, my love affair with daisy wheels is rekindled. I’m going through some old 80-Micro magazines, and two editorials a year apart caught my eye. How can a think tank be so right and so wrong at the same time? The Future from 1981 last modified January 18th, 2015.